Event is now SOLD OUT. Embark in Peekskill might have tickets for the same production Sunday at 3 pm. 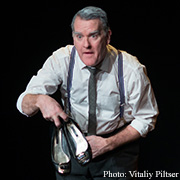 Written and performed by award-winning Irish playwright/actor Mikel Murfi, Loco and Reckless Productions and the Irish Arts Center in NYC brings us the story of cobbler Pat Farnon. The Man in the Woman's Shoes was originally commissioned by the Hawk's Well Theatre in Sligo, has toured extensively around Ireland, won the Stewart Parker BBC Radio Drama Award in 2013, was nominated for Best New Play in the Irish Times Theatre Awards 2014 and was a NY Times "Critic's Pick" when it played at the Irish Arts Center (NYC) in March 2015. Mikel Murfi has just starred opposite Cillian Murphy and Stephen Rea in Ballyturk written and directed by Enda Walsh, which played to sold-out houses in Galway, Dublin and at the National Theatre in London. He is a founding member of Barabbas Theatre Company and was last in New York when he directed Penelope by Enda Walsh at St. Ann’s Warehouse. His films include The Commitments, Guiltrip, The Butcher Boy, Ella Enchanted, Intermission and most recently Jimmy’s Hall directed by Ken Loach. When you purchase a "Theatre Program Supporter" ticket, the portion that exceeds the usual price is tax-deductible because it supports ongoing efforts to bring additional theatre projects to the Center. In appreciation, supporters are credited in the programs. This program is made possible, in part, through the Putnam Arts Council’s Arts Link Grant Program, which is supported with public funds through the NYS Council on the Arts with support from Gov. Andrew Cuomo and the NYS Legislature.